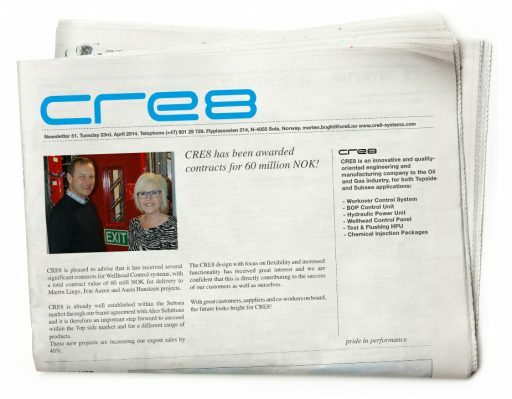 CRE8 has been awarded contracts for 60 million NOK! CRE8 is pleased to advise that it has received several significant contracts for Wellhead Control Systems, with a total contract value of 60 mill NOK for delivery to Martin Linge, Ivar Aasen and Aasta Hansteen projects. CRE8 is already well established within the Subsea market through our frame agreement with Aker Solutions and it is therefore an important step forward to succeed within the Top side market and for a different range of products. These new projects are increasing our export sales by 40%. The CRE8 design with the focus on flexibility and increased functionality has received great interest and we are confident that this is directly contributing to the success of our customers as well as ourselves. With great customers, suppliers and co-workers on board, the future looks bright for CRE8!